Van Gogh Starry Night tapestry is based on the remarkable work of Van Gogh. Of all the pieces by Van Gogh, this piece "Starry Night" shows his evocative impressionistic style of nocturnal subject matter to best effect. Though well known for his post impressionistic pieces of bright daytime subjects, this is his signature piece of the night. In this work we see the night sky awash of movement and iridescent with movement from the star and moonlight. It is as if Van Gogh saw the night sky alive and imbued with energy that is unseen. This scene is the view that he saw from his room by night. This piece is regarded by most as his opum magnus or his "great work". Beneath the stars lies the small town and church steeple can be seen in the mid ground and is the village of Saint-Remy. 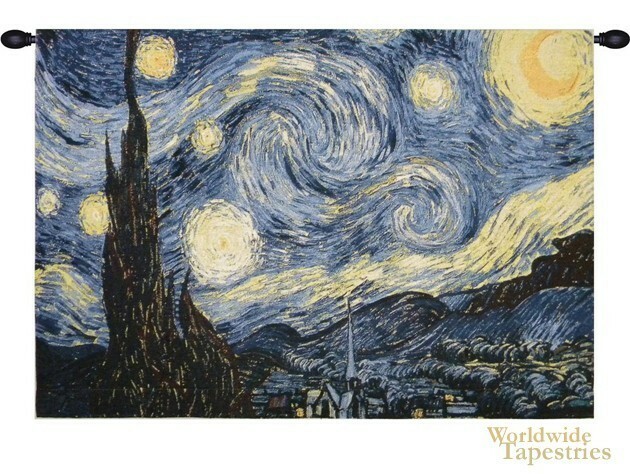 This fine art "Van Gogh Starry Night" tapestry is backed with lining and tunnel for ease of hanging. Note: tapestry rod and tassels, where pictured, are not included in the price. Dimensions: W 45" x H 32"